Defending champions Clitheroe remained on course for defending their Ribblesdale Cricket League crown for a second time after beating Earby. In response to last weekend’s 88-run defeat to Read, only their fifth loss in 54 outings, Paul Gaskell’s side registered a 75-run triumph at Chatburn Road to remain four points behind leaders Settle. Richard Craddock ousted the home side’s opening batsmen Jack Dewhurst, for a duck, and Bilal Ahmed (11), before Ali Ian Ross edged the tally in the right direction with a knock of 30. Paid man Janaka Guneratne failed to post a score, surviving just four balls, as Earby continued to threaten but the following trio moved the hosts back in to the ascendancy. Peter Dibb fired 33, Naeem Ashraf added a half-century and Charlie Dewhurst made his contribution with 24 as Clitheroe finished on 179. In reply, the visitors started well with just two wickets down at 51. Matthew Garner made 42 for Earby, though he was unaided by his team-mates as the remaining eight wickets went for just 53 runs. Marcus Sharp claimed 5-42 for the hosts while Guneratne added 4-27. That result christened a fruitful weekend for Clitheroe as they earned an LCB Knockout Cup tie with either Settle or Lytham next month with victory over Leigh. Jack Dewhurst (87) and Guneratne, who smashed an unbeaten 128 in emphatic fashion, put on 175 runs for the second wicket to take the game away from their opponents. 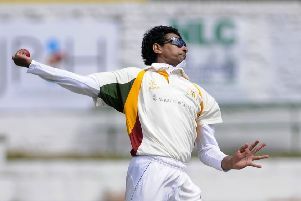 The Sri Lankan hit eight fours and six sixes from 102 deliveries as Clitheroe made 274-4. Leigh, in response, were 148 runs short, as Sharp and Dewhurst claimed three victims apiece while Harry Laing added 2-32. Elsewhere, Read’s double dose of victory ensured Kyle O’Connor’s men stayed in touch with the league’s table toppers while moving a step closer to retaining the Twenty20 trophy. Tom Turner reached an unbeaten 55 as the hosts totalled 137-6 at Whalley Road while paid man Keegan Petersen took figures of 3-13 to force the visitors 49 runs short. Read went on to beat Great Harwood by 24 runs at the Cliffe. Michael Whalley top-scored with an unbeaten knock of 44 and Petersen added 24 in their total of 133-6. Andrew Rushton restricted the hosts with figures of 5-19 from 13 overs to secure maximum points. Despite Ryan Canning’s knock of 71, Ribblesdale Wanderers lost by five wickets to Settle in the Twenty20 competition but Salesbury made a winning start when overcoming Euxton by seven wickets. James Watson, 46 not out, and professional Susantha Pradeep (32) did the damage for the hosts at Ribchester Road. However, Stephen Brown’s side couldn’t extend that form in to the league as they lost by 76 runs to Whalley at Station Road. Overseas amateur Hiken Shah (56), Lee Kearsley (48) and Matthew Howarth (30) were the stand-out performers for the home side as they culminated their innings on 190-6 before Simon Gorton’s exquisite seven-wicket haul forced the issue in response. Gorton went for just 33 runs from a 12-over spell, with James Watson’s 36 the best Salesbury could offer. Scott Wharton also added 23 to the tally.